What is the aim of the One Biosecurity program? The One Biosecurity program is a new initiative to further promote and protect South Australia’s strong biosecurity regime across its livestock industries. The aim of providing an online system to support this is to allow producers to record and assess their biosecurity practices, and then to share that information with other producers and potential purchasers. Asking the right questions and getting the right answers about the biosecurity practices of the farm of origin and the health status of stock before transport or purchase is essential to minimising the risk of entry and spread of diseases between properties and across the state – as well as reducing risk to those buying and processing livestock. How does the One Biosecurity online program work? Once a producer is registered on the One Biosecurity website, they will be self-guided through the program’s two main components: the Biosecurity Practices Questionnaire, and Disease Risk Rating modules. Further information on these components, as well as the other available features of the program, is provided below. For instructions on how to register click here. What is the cost of the program to producers? There is no additional cost for producers to use the One Biosecurity online program. One Biosecurity is a service available to all South Australian PIC holders producing sheep and/or cattle. Is this a voluntary or compulsory program? It is voluntary to join the online program but all members must adhere to the terms and conditions, and know that their practices can be audited. Many of the recommended biosecurity practices are actually enforceable by legislation, under the Livestock Act and the Animal Welfare Act. What are the benefits of registering on One Biosecurity? At its most basic level, the One Biosecurity online program provides a simple tool with which to complete a biosecurity plan for your property. Numerous programs now require you to have a biosecurity plan, such as the Livestock Production Assurance program (click here for further information on LPA) and the Johne’s Beef Assurance Score (J-BAS). With the One Biosecurity program you can complete, store, update, and share your biosecurity plan with ease. In sharing biosecurity information through One Biosecurity, this can support producers and buyers in making purchasing decisions. More information on the animal health and biosecurity status of the property of origin allows for more informed purchasing decisions. More broadly, One Biosecurity will help to meet the demand for traceability and provide credible assurances to domestic and international markets, to support market access. Can interstate producers register with One Biosecurity? Not at this stage. One Biosecurity is a South Australian initiative which aims to promote South Australia’s strong biosecurity regime across its livestock industry. However, if you want to provide your biosecurity information to interstate buyers it can be easily downloaded in one PDF document, which can be emailed or provided in hardcopy to buyers without access to the online program. Can interstate producers view my One Biosecurity profile? Interstate producers cannot register on One Biosecurity at this stage and therefore cannot view your One Biosecurity profile online. However, if you want to provide your biosecurity information to interstate buyers it can be easily downloaded in one PDF document, which can be emailed or provided in hardcopy to buyers without access to the online program. How can agents, abattoirs or saleyards register on One Biosecurity? Is One Biosecurity an audited program? Yes, One Biosecurity is an auditable program. This process of verification is extremely important because it provides credibility to the system and confidence in the claims made. An auditable system provides documented evidence of biosecurity practices, which are consistent and on-going. Trading partners also visit farms, so the evidence of verified practices is essential for their auditors too. How do I promote my One Biosecurity registration? The One Biosecurity Style Guide (which can be downloaded here) has a variety of ideas, material and guidelines on how you can use the "1B" motif and branded images. 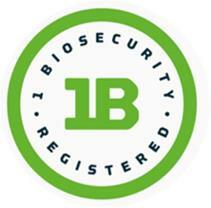 Registered users of One Biosecurity can add the "1B" motif to their website, marketing materials or email signature. We also have a variety of promotional tools for registered users – like a One Biosecurity keyring or bumper sticker – you can find at your local PIRSA Regional Office or the PIRSA tent at field days. Can my agent see my One Biosecurity profile to use in marketing my stock? If your agent has One Biosecurity registration and if you have a rating of three stars or over and make your One Biosecurity profile public they will be able to view your profile. What is a Biosecurity Rating? The biosecurity rating is the core component of the One Biosecurity online program. It is a rating (or score) between 1 and 5 stars based on the biosecurity practices undertaken on the property. Three stars (out of 5) is considered a good biosecurity standard for the majority of commercial livestock producers in South Australia. A 3-star rating should be achievable for most producers, and many would meet this score without changing any of their current practices. The aim of the biosecurity rating is to assess and record enterprise biosecurity practices, determine if there are any gaps or areas which should be addressed, and then to work towards achieving or maintaining the most appropriate level of biosecurity for the enterprise. It is entirely appropriate for many enterprises not to achieve a 5-star biosecurity rating, as this will be determined on the level of exposure to risk and the market into which the business it trying to sell. How do I get a Biosecurity Rating? Once you are registered with One Biosecurity you will need to login and create your profile (for instructions on how to register click here). You can then complete the Biosecurity Practices Questionnaire, which will assess and score your biosecurity practices against best practices. You will then receive a rating of between 1 and 5 stars, as described above. Why should I have a Biosecurity Rating? A completed questionnaire will constitute a recorded biosecurity plan for your property. The advantage of a One Biosecurity plan is that it rates your biosecurity practices against best practices, and allows you to compare your biosecurity practices to other producers. If necessary, the questionnaire and rating achieved can be used to identify additional measures to improve your on-farm biosecurity. What if I'm not happy with my Biosecurity Rating? If you are not happy or disagree with the biosecurity rating you have received, you are encouraged to contact your local Biosecurity SA Animal Health officer for advice. Please click here for the contact details of your local Animal Health Officers. When you complete the biosecurity questionnaire your rating is private and you choose whether to share it with other members (note: only ratings of 3-stars and above can be shared). You can update the questionnaire at any time, if you have implemented new biosecurity practices or changed your biosecurity practices. When you update the questionnaire it will reassess your practices and assign an updated biosecurity rating. What is a Disease Risk Rating? Once you have completed the biosecurity practices questionnaire and received a biosecurity rating, you can choose to also complete one or more of the disease risk rating modules for specific endemic diseases that occur in South Australia. Each module will guide the user through a series of questions regarding biosecurity best practice for specific diseases. Depending on the answers, a classification of ‘independently assessed’, ‘self-assessed’ or ‘managed’ will be provided. If no information is provided, or the practices carried out do not meet the criteria for one of these categories, the system will default to ‘not currently classified’. Properties rating as ‘independently assessed’ or ‘self-assessed’ are considered low risk for the presence of that particular disease, with high levels of biosecurity in place. How do I get a Disease Risk Rating? To obtain a disease risk rating you need to select from the list of endemic diseases, which will vary depending on the species and enterprise type you have registered. You will then be guided through a series of questions regarding your biosecurity practices for that particular disease. Each rating has a number of biosecurity practices that are essential to achieve that particular rating. Note that in order to complete any of the disease risk rating modules you must complete the biosecurity practices questionnaire first. Which diseases can I obtain a rating for? Why should I have a Disease Risk Rating? Completing the disease risk rating(s) provides additional details for your biosecurity plan and more specific animal health and biosecurity information about your livestock for potential purchasers. Each disease risk rating module can also support your status in other programs – for example the Johne’s Disease (Beef Cattle) module will demonstrate your Johne’s Beef Assurance Score (J-BAS). And, where necessary, they can suggest additional biosecurity practices that can help to lower your risk of introducing and/or better managing the disease. What if I'm not happy with my Disease Risk Rating? If you are not happy or disagree with the disease risk rating you have received, you are encouraged to contact your local Biosecurity SA Animal Health officer for advice. Please click here for the contact details of your local Animal Health Officers. When you complete the disease risk rating modules, your ratings are private and you choose whether to share them with other members. You can update the questionnaires at any time, if you have implemented new biosecurity practices or changed your biosecurity practices. When you update the questionnaire it will reassess your practices and assign an updated disease risk rating. What else can I do within the One Biosecurity online program? Generate a summary of your biosecurity practices. For each questionnaire that you complete you will then have available a summary of your biosecurity practices. The summary includes details about the enterprise you have recorded in One Biosecurity, the biosecurity practices that you carry out, and any additional comments you have made within the questionnaire. You can choose to share this summary with other One Biosecurity members, and you can also download and save it as a PDF. Each available PDF summary has a section at the bottom that can be reviewed and signed by a veterinarian, if desired. This is not a requirement to be a One Biosecurity member, but is a requirement of other programs such as J-BAS (Johne's Beef Assurance Score). Generate an Animal Health Declaration. You can generate a PDF version of the Animal Health Declaration (sheep or cattle). This will pre-fill the form with your PIC number and some of your personal details, as well as answering some of the questions as per your answers within One Biosecurity. Not all details will have been pre-filled. You will need to print out the form, complete any remaining questions, check all details are correct, and then sign the declaration. The One Biosecurity system will send you an email reminder when you should update your biosecurity and disease risk ratings. Also, when uploading documents, such as a certificate, you can set an expiry date and you will receive a reminder when this is about to expire. You can turn off email notifications at any time, if you do not wish to receive them. Record notes on your routine animal health management. You can add additional details about your on-farm animal health management, to further support your One Biosecurity status. A list of common vaccines is provided for you to select from and/or you can fill in the details in the text box provided. You can also outline your standard management protocol for parasite control, such as the product(s) used, the timing of treatments, etc. This section is optional. If you choose to provide any details they will appear on your enterprise page. Otherwise, it will remain blank. Record your accreditations and other programs. To demonstrate to other members what other accreditations you hold and/or what programs you are involved in, a list of these is available for you to select from. This includes Livestock Production Assurance, Meat Standards Australia, Certified Organic (Australia), and many others. Ideally, you would then upload a certificate (or other evidence) of your membership of the relevant program(s) in the documents section. The section is optional. If you choose to provide any details they will appear on your enterprise page. Otherwise, it will remain blank. Once you have created your One Biosecurity profile and filled out the biosecurity practices questionnaire, you will be able to search for other One Biosecurity members. You must enter either an enterprise name or a South Australian PIC, or select a species or region to start searching. You can then filter the search results on region, biosecurity rating and/or disease risk rating. Only enterprises that have been shared can be found in the search. Share your biosecurity information with other members. When you have completed your biosecurity rating and achieved a rating of 3-stars or higher, you can choose to set your enterprise page to ‘public’, which means that any One Biosecurity user can view the page. You control what you share with others on the page – you can just share your ratings, or you can also share the summaries of your biosecurity practices and/or the documents you have uploaded as evidence to support these practices. When searching for other members’ pages you will be able to view whatever information they have shared. One of the key components of making better informed purchasing decisions and maintaining a high level of biosecurity is the ability to check or verify the biosecurity practices being undertaken. Therefore, it is essential that documented evidence is uploaded (such as certificates or laboratory results) to support the answers you have given in each of the questionnaires. You can upload documents to be recorded against your biosecurity rating or each of your disease risk ratings, or general documents which may be supporting evidence for assurance programs or animal health management activities. If your document has an expiry date (e.g. a certificate) and you would like a reminder as to when it expires, you can set this when you upload the document. You can choose whether or not to share these documents with other members. Even if you don’t share them with other members, it is important to upload them for verification/auditing of your status, and this is also a useful place for collating these documents.